Being a pet groomer is not like being a beautician for animals only. Pets do have very specific needs and because those needs are very different from those of a human, to become certified as a pet groomer, you will need special training to provide those services. If you decide and feel that your love for animals surpasses that then those of, say your own family, and your love of animals is strong enough, you might just want to take the time to make pet grooming your career choice. While cosmetologists and doctors have to have a special love for the human being, and how they look and feel, the pet groomer is required to love animals just the same-if not more on at least some levels. There are a host of training and testing services available to certify your experience as well as a master certification awarded by The National Dog Groomers Association of America (NDGAA). This is a coveted certification in the industry. To obtain these certifications and advance your way through the world of pet grooming, you will attend frequent workshops to learn different breeds and their requirements. Once you reach certain requirements, you can then sit for the exams involved. An Accredited pet grooming schools in your area can help you reach these requirements. This is a profession completely driven by love of the job-and the animals- and you can expect strong personal and emotional satisfaction if this career is truly, what you want to do. Once in the profession, many move-on to more demanding job sets and begin the pursuit of a bachelor’s degree in animal science, marine biology or another field of related study. With these degrees under your belt, you are free to pursue a higher paying and more demanding job in the field, such as a Certified Kennel Operator, among other areas and titles. This is why it is imperative that you love what you are doing. Â Over the next ten years, the number of certified animal care workers is expected to increase by a whopping 18 %. 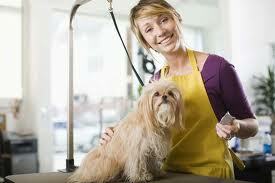 Pet groomers will have excellent job growth. With services such as mobile grooming among others just the same in terms of technology, they will continue to grow in popularity. The factors driving these fields are diverse; however, the most significant factor would be retirement, as more and more pet groomers seem to be reaching that age. On the other hand, the number of "companion pets" is expected to rise as well and this means higher demand for trained workers. This is a baby boomer phenomenon and as they begin to move into retirement, their need for pet care will grow because they won’t have the ability to groom their pets by themselves anymore. This is generally considered a very easy profession to get your start in early. Because of these factors and the entry requirements, more people are considering this as a legitimate job choice. Of all the various specialties of dog trainers and groomers, all are expected to experience conditions that are more favorable, while driven by their owners’ desire to instill obedience in their pet. Opportunities for dog trainers should be best in large metropolitan areas, where the business world is more involved with their own things and seem to have less time to care for their pets.